On Wednesday, May 4, the Lilly Pulitzer store in Ardmore, PA will host a very special event for a very special little girl. "Sip, Shop and Share" is a perfect opportunity to view and purchase Lilly Pulitzer’s new summer collection while helping baby Julia. To learn more about Julia, you can go to her Caring Bridge website. Please sign the guest book and leave a message for Julia. Julia's parents truly enjoy reading well wishes of support and prayer. 10% of sales from the event will benefit Julia’s treatment. If you're like me, you won't be hard pressed to find a long list of must haves for summer, but here are a few of my favorites to get you started. The Delia dress in Hotty Pink Flock to Me Embroidery is unique and gorgeous. I love the color combination and pretty embroidery. The adorable scalloped hem is the cutest detail on Lilly's Buttercup short pictured in Classic White Had Me a Blast. What a fantastic update on a summer wardrobe staple. Last year, I had to scoop up the Wynne top in every color! I kept thinking that I would love to see the top in a print. Well, the design peeps at Lilly must have heard my request, because I am loving this winning top in a perfect print. The Wynne is so versatile, too, as it can be worn on one shoulder or off the shoulder. Shown here in Limeade Cherry Begonias. But perhaps my favorite part of the summer collection is the nautical inspired pair of wedge sandals. 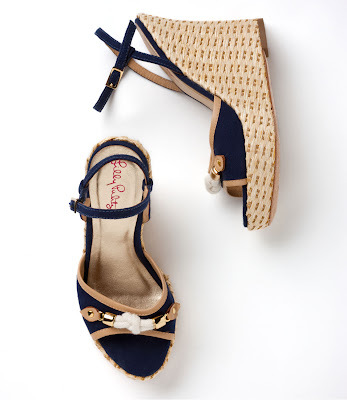 Lilly Pulitzer Just a Little Knotty Wedge in True Navy sits at the very tippy top of my wish list. Please call the Ardmore store directly at 610 658-0387 to place your order by phone. There are some gift with purchase opportunities available, too. Be sure to mention that you saw this event mentioned on Maryland Pink and Green. You may call now to put your items on hold before the sale starts. This is a very good idea, because you'll get the best selection and the sales associates will be able to take phone orders when the store is not busy hosting the event. Let me know what goodies you find! Bethany, if I know of something I want, can I call and place an order without going? (I live in DC. Love the printed Wynne top! Must have! Hello MaryLou! You can call the store directly and they will be happy to help you. I'm not sure if she will be working today, but my friend Steph works there and she's a doll. Tell her I said hello!